A Good Dog! Facility Dog is an autism service dog that lives and works with its autism service provider/handler (like a Speech Therapist, an OT, or even a School Principal). The handler is a professional who utilizes the dog to help people with autism meet their goals during either therapy sessions or school days. The service provider must work primarily with children with autism and can be an Occupational Therapist, Physical Therapist, Recreational Therapist, Speech Therapist, Special Education Teacher, or Autism Therapist. 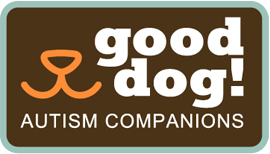 What does an autism facility dog do? Increases Motivation: When children with autism interact with a facility dog, student motivation increases, which leads to increased involvement. Because the dog offers unconditional love and is nonjudgmental the children are more motivated to participate. Provides More Opportunities for Language: Motivation to spend time with the dog (petting him, brushing him, playing with him, etc.) can encourage language in a child who has speech difficulties. Increases Gross & Fine Motor Activities: For those children developing their gross motor and fine motor skills, a well-trained dog can serve as a great motivator. Playing fetch, brushing the dog, feeding the dog, brushing the dog's teeth, all serve a motor function! Calms and Comforts: Studies show that a service dogs actually reduces stress hormones in most children with autism. Just having the dog present in therapy sessions or classroom creates a calming affect. The dog becomes a friendly, familiar, accepting constant in the child's therapy session or day at school. Increases HAPPY: Both children and staff find themselves enjoying their day and laughing more with a dog around! Other benefits and uses of a Good Dog! facility dog include: using the dog as part of the reward system; reading aloud to a dog, which research has shown can help improve reading ability; increasing confidence and self-esteem by teaching new commands to the dog; overcoming fears and developing more confidence around dogs; learning to interact with a dog, which promotes theory of mind and improving social skills.